In a meeting in a New York loft last year, Apple told around 30 developers that they ought to embrace subscription models. The developers, Apple told them, needed to be concerned with recurring revenue from subscriptions rather than one-time sales. This has resulted in more apps switching to a subscription model, leading to Apple's announcement in its last quarterly earnings report that paid subscriptions from Apple and third parties had passed $300 million. The report does not make clear which developers were at the meeting, who was there representing Apple, or who owns the Tribeca loft where it took place. What we do know is that what Apple introduced to the developers at that 2017 meeting is reportedly internally referred to as "Subscription 2.0," an initiative that has been in the works since 2016. At the meeting, the developers were told that they needed to shift their focus away from upfront cost and towards long-term engagement and recurring revenue. This was at the heart of Subscriptions 2.0, which Business Insider describes as "a way for developers that made utilities and other kinds of apps to bill their customers on a regular, recurring basis." The meeting included talk of "launching, customer acquisition, testing and marketing, engagement, retention, monetization, and paid search ads." Under Apple's revised subscription model, announced in 2016, the company continues to receive 30 percent of the subscription cost, but after a year, that figure is cut to 15 percent. The remainder goes to developers and app publishers, an incentive to adopt subscription pricing. There are now about 30,000 subscription-based apps in the App Store. While only a small percentage of available apps in the App Store use the model — and many of those are non-indie giants like Netflix, HBO Now and Tinder — Apple is reportedly happy with how the effort is going. Examples of successful subscription apps, according to the story, include FaceTune 2, a sequel to FaceTune, which was the top downloaded paid app own the U.S. as of last week. FaceTune 2 has notched 500,000 active subscribers. 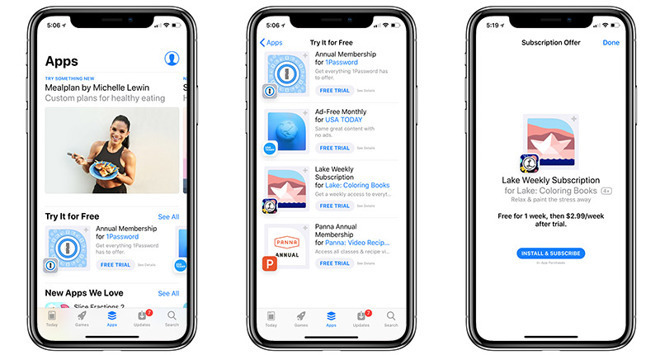 In January, Apple launched an app store section featuring free trials for certain subscription apps.